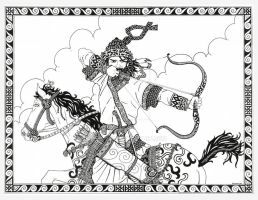 Zartosht was an ancient Iranian prophet and the founder of Zoroastrianism, a religion that was the national religion of the Sassanian Empire of Persia. Zoroaster is generally accepted as an authentic historical figure.Many scholarly estimates place him circa 1200 B.C., making him a candidate to be the founder of the earliest religion based on revealed scripture. The basic precept of Zoroastrianism is the maxim “Good Thoughts, Good Words, Good Deeds." His book name is avesta. Zardosht (peace be upon him) deserves more recognition in history than he already has. He is one of the earliest recorded messengers of God. eshghe!!! Asheghe oon theme range talaiam ke roo headbandesho roo sooratesh ejra kardi... karo fogholade kardeo be zartosht ye obohate khasi dade... vaghean tabrik migam... mesle inke injoori nemishe... baiad kam kam bezanam too kare real..
Zoroaster was a great man. This is a beautiful piece; Definately a favorite. magnificent! your technique is wonderful, the details are perfect ... love the colors. by the way,did you have any references for the portrait? Wonderful Painting , wonderful subject matter. very very very very very nice.tanx. So beautiful. I love the colors you chose in this peice. Zartosht would be proud! very impressive, I like that paint a lot. Fascinating portrait, great work. This really reminds me an old master painting. Another excellent portrait. Fascinating subject. I actually met someone here recently who is a Zoroastrian, from Iran. oh its great .Zoroastrians live in iran and india and some other countries.